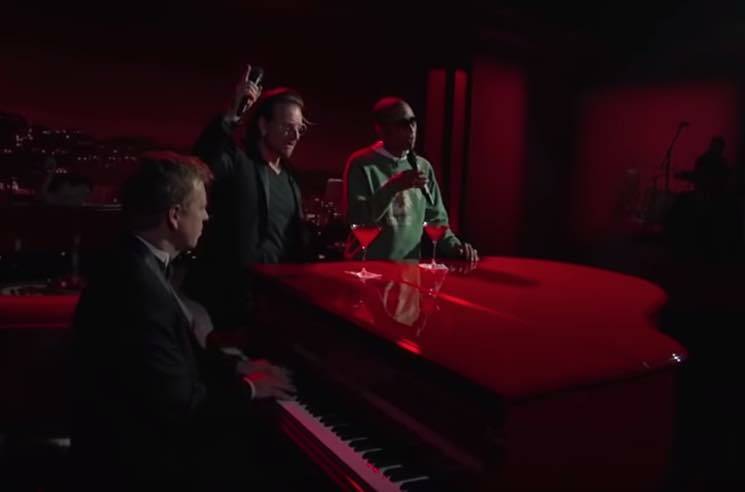 In what is quite possibly the cheesiest performance of all time, U2 frontman Bono and Pharrell joined forces to cover the Bee Gees on TV last night (November 19). The pair appeared on Jimmy Kimmel's annual (RED) episode, promoting Bono's HIV/AIDS aid organization. But just because they were raising awareness for a good cause, though, it doesn't mean it wasn't painful to watch. The pair delivered a lounge-ready rendition of Bee Gees mega-hit "Stayin' Alive," accompanied by just a single piano and a couple of martinis. The audience's clapping and Pharrell's ad libs only made it even campier.